The latest movie adaption of The Jungle Book is out now, bringing Rudyard Kipling’s classic tale of exotic India to life in a new and fresh way. Rudyard Kipling was born 150 years ago in Mumbai (then Bombay) and his most famous work was inspired by India’s beautiful natural environment. Sadly, it has been significantly eroded since the real Jungle Book was published at the end of the 19th century. His tale of Mowgli the boy-child who is adopted by wolves and grows up learning the law of the jungle is a beloved classic. Kipling described his childhood in Bombay, where “in the afternoon heats before we took our sleep” the childrens’ ayah (or nanny) or Meeta (the Hindu bearer, or male attendant) would tell them “stories and Indian nursery songs all unforgotten…” He wrote that he thought and dreamed in Hindi but then had to haltingly speak English to his parents at dinner. Where is the real Jungle Book set? Initially Kipling set the Jungle Book in an area of Rajasthan that he knew well but later decided to move the location to in an area of India’s Central Provinces. Seoni is a small town in what is now the state of Madhya Pradesh. Kipling never visited this area himself but he had friends who had gone there on vacation and he saw their photographs. He also used reference books to achieve the realistic descriptions of India’s natural world. But Kipling was more than anything else writing fiction. The luminous prose of his Jungle Book created a 19th century fairytale that rests in all our minds if we have read it as youngsters. The world of the real Jungle Book can still be experienced, in some of India’s famous national parks. The species nature-loving visitors to India most want to see of course is the tiger. Mowgli’s powerful antagonist, Shere Khan is a cruel Bengal tiger, who fears only guns and fire. This magnificent, highly-endangered species faces ongoing habitat destruction and poaching. Just under half of the world’s remaining wild tiger population is to be found in India but the 1,400 tigers are spread thinly, over more than 40 national parks across the country. Pench National Park is closest to the actual town mentioned in the Jungle Book, Seoni, so this 300-square-kilometre park is the place that can truly claim to be the original setting of the real Jungle Book. The heart of the park is the Mowgli Pench Sanctuary, with damp valleys and rolling hills covered with dry deciduous forest. Pench has a wide range of plants and animals, including good populations of Chital and Sambar deer. As well as tigers and deer, you may see wild boar, lots of beautiful birds such as wild peacocks, and maybe even nocturnal cats such as leopards and the Fishing Cat. Maybe you’ll see Mowgli striding through the long grasses or Rikki Tikki Tavi looking out from a rocky outcrop. The Kanha National Park wasn’t created until 1955 but it is at the heart of the area in Madhya Pradesh province that Kipling chose as the setting for the Jungle Book. The bamboo forests and grassy meadows dotted with lush ravines are said to have inspired Kipling. This is a very well maintained park that has carried out important conservation work over the years, particularly protecting the Barasingha, a rare hardground Swamp Deer that was close to extinction. Kanha has a diverse wildlife population, including Chital, langurs, jackals, striped hyenas, mouse deer and ant-eating pangolin. It also includes the important Kanha Tiger Reserve, set up in 1974 under Project Tiger, where open meadows offer good opportunities for tiger spotting. Make sure you visit Sunset Point (Bamni Dadar is the local name), where the views at the end of the day are stunning and you can see peacefully grazing Sambars and Gaurs in a truly beautiful natural setting. You might see Mowgli on the lookout for Shere Khan. Do an early morning safari also, from the quieter Mukki entrance. 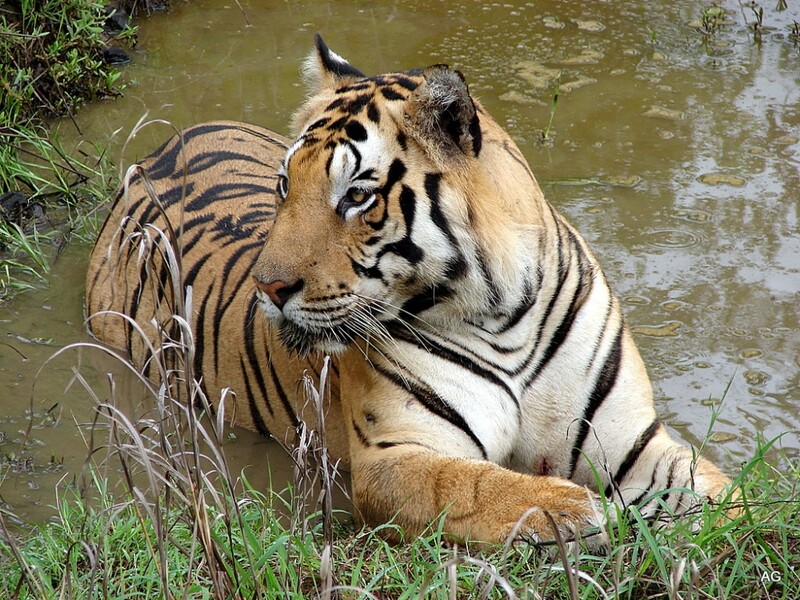 The Corbett National Park is probably India’s most famous wildlife sanctuary. It was set up in 1936 as India’s very first national park in consultation with Jim Corbett, who was a well-known hunter (of man-eating tigers and leopards) who later became an author and naturalist . He played an important role in the creation of this first reserve for the endangered Bengal tiger. Corbett sits in the foothills of the western Himalayas in the state of Uttaranchal and has grown to cover over 1,300 square kilometres of preserved forest habitat, including the Sonanadi Wildlife Sanctuary.The primeval jungles of the park are said to have inspired Kipling and Corbett manages to hold on to its wild atmosphere despite extensive tourism. The landscape is stunning and there are herds of Asian elephants roaming the savannah. Tadoba Andhari Tiger Reserve is another area of conservation land not far from Pench and Kanha, where Jungle Book wildlife encounters are highly likely. Tadoba boasts the most visible number of tiger sightings in India’s Maharashtra state. On game drives at Tadoba you will see wild dogs, hyena, sloth bears, wild boar and many other species, as well as the mighty tiger and the shy leopard. Ranthambore National Park is much smaller than the others at only just under 400 square kilometres but it is well worth a visit. Ranthambore is in Rajasthan, which was the area Kipling originally chose to be the setting of Jungle Book, and it is most loved because of it is scattered with picturesque ruins. The park is also famous for its tigers and you have a good chance of seeing these majestic predators in this lush jungle habitat. If you love the latest movie adaption of Rudyard Kipling’s classic story, and you’re a wildlife and nature lover, you’ll want to plan a once-in-a-lifetime trip to India to experience the real Jungle Book at one or all of these incredible national parks. When to visit: The best time of year to see tigers and other wildlife in India is during the summer months (April to June), when tigers are more likely to be out searching for water. However, the parks are open from October to June. You can expect very high temperatures so dress in cool clothing that covers your skin and drink plenty of fluids. How to get there: For Kanha, Pench and Tadoba the best international airport to fly into is either Mumbai or Hyderabad. The closest large domestic airport is Nagpur. Both Ranthanabore and Jim Corbett are within a few days travel of New Delhi. India has a comprehensive railway network and it is also possible to book private tours to visit the tiger parks. Where to stay: The India national parks mentioned above all have accommodation nearby, including safari-style tented accommodation. How to see the wildlife: Make sure you go on a proper wildlife spotting safari rather than a tourist occasion where elephants are used to block tigers into position for tourist photos. Safaris will be at dawn or dusk and can be by safari vehicle or on elephants. You are more likely to see the rarer beasts on the back of a quiet elephant. How to prepare for India travel: Make sure you see a travel doctor well ahead of your trip to India to get the necessary inoculations. For more trip planning advice see the Incredible India tourism website. Natasha von Geldern is a travel writer, editor and blogger who is passionate about making the pages of the atlas real and a firm believer that everyone should travel. She contributes to a wide range of travel publications as well as running her independent travel blog World Wandering Kiwi. Natasha has traveled to over 50 countries and adores being inspired to travel by books, films and history. As well as being an intrepid traveller she is a snap happy photographer, an arts and literature fiend, and a lover of the great outdoors who enjoys physically challenging activities retrospectively.